A safe and sterile playground for who? When it comes to playgrounds, a 5 year research study from UBC recommends municipal park planners dump the pricey playground equipment in favour of designing more natural spaces for kids to play. We found that outdoor play spaces that contain materials that children could manipulate — sand, water, mud, plants, pathways and other loose parts — offered more developmental and play opportunities than spaces without these elements. The report seems to suggest that playground equipment is designed more for adult piece of mind rather than to challenge and aid kids in their development. Such an emphasis has been placed on safety that it has sucked all the challenge out of most contemporary play spaces. The playground equipment industry has a very aggressive marketing campaign going on that is largely based on putting fear and guilt into the minds of parents. Landscape architects are under a lot of pressure to simply install equipment because its easier and more recognizably accepted by adults as a place to play compared to [a more natural environment]. My own experience has found this to be mostly true – that more often than not my kids will tend to favour natural play settings over playground equipment. At my daughter’s school, there is a playground which is surrounded by a thick cedar hedge along the fence line. Over the years, kids have worn trails through the hedge and have created caves and hiding spots in the hedge. On any given day there are just as many kids zooming in and out of those trails and trees as there are climbing on the playground equipment. Our backyard is another example on the natural side. We have both a backyard climbing structure/fort thingy, and two apple trees and an empty garden plot full of dirt. Guess which get played with more? Yep, mud and tree climbing wins the day, with the playhouse structure taking more damage from the weather than from kid use. and he is good for a morning. I think that some playgrounds are becoming sterile environments because playgrounds are often spaces for parents moreso than kids. Sure, we want our kids to be safe, no question. But sometimes I wonder if that emphasis we put on safety is really an excuse for us to not pay attention. I am not talking about hovering and preventing our kids from exploring the boundaries of their physical bodies in a safe way, but rather how many times I have been at a playground and see parents chatting away to each other, completely oblivious as to what their kids are doing. The playground has become a social center for parents and a kind of babysitter. Not that parents shouldn’t socialize and visit – playground conversations with other parents has often been some of the most productive parent networking I have done. But I have seen many an oblivious parent use the playground as a babysitter, completely abdicating the responsibility of making sure their kid is safe to the municipal park planners, who in turn take their marching orders from lawyers and risk assessment professionals who always err on the side of caution. Meaning our kids get sterile playgrounds. This entry was posted in All The Rest, Education, Uncategorized. Bookmark the permalink. Another reason playgrounds have become so sterile is to make them less lawsuit-prone. In our misguided zeal to make them safer, we've stripped most of the fun & learning opportunities out of them too. And there's an interesting theory called risk homeostasis that suggests that people have an innate target level of acceptable risk which does not change. That is, when a play area is made “safer,” kids simply find new ways to use it, generally keeping the risk or rate of playground-induced injuries constant. Overprotecting children is only hampering their development – bumps & bruises are natural byproducts of trying new stuff & learning new skills. 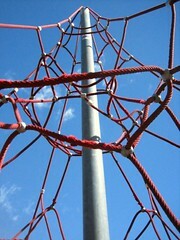 Playgrounds should be places where the kids have fun and can make friends. It is important that a kid make social contacts wth other kids. They learn from each other. This is the way a playground should be designed. There should be some tricky things that the childrean has to discover together. So the learning process is more effective. With a parent watching after them and help the childrean in difficult situations, the childrean can develop its own personality.